What is a buddha bowl? A buddha bowl is a whole bunch of good stuff in a bowl topped with more good stuff. Today we are talking whole grains, lean proteins, tons of veggies, nuts, seeds, and dressings! Some people call buddha bowls, meal prep bowls. Whatever you call it, we are going to break it all down so you can make the best meal prep bowl for your week! Bowls bowls bowls, I’m all about that bowl. 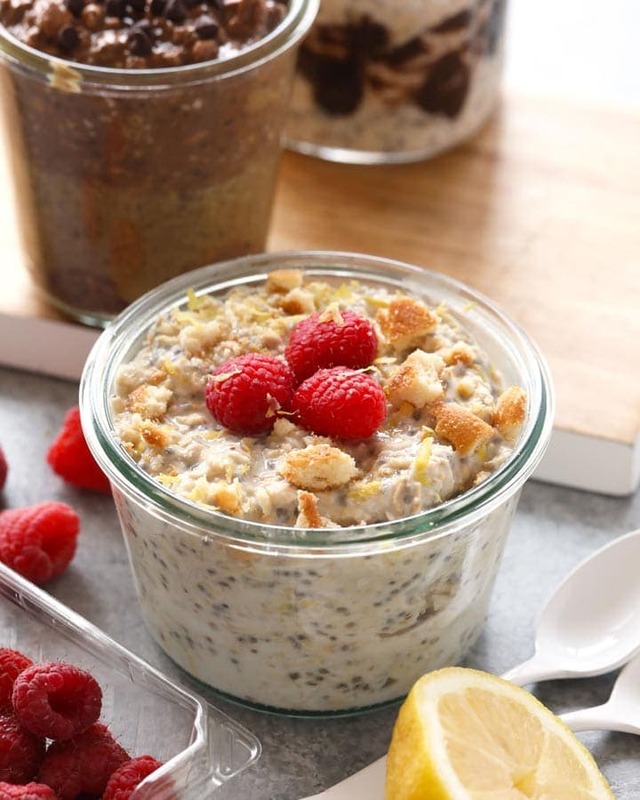 Especially…buddha bowls! Why? Bowls = meal prep at its finest. If you haven’t jumped on the meal prep bowls bandwagon, get on it! Meal prep bowls will make your life so much easier during the week and it will help fuel healthy habits. 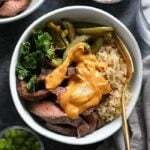 Today, we are breaking down the anatomy of a buddha bowl and we are sharing recipes to inspire you to start making meal prep bowls in your own kitchen! One way to shake up your Buddha bowl is with spices. Simply Organic and Penzys are my go-to spice brands for adding amazing flavor to anything that I make. They’ve got literally every spice under the planet, plus some awesome blends that I use daily. Really the main goal of a buddha bowl recipe is to eat as many colors and nutrient dense foods as possible. No two buddha bowls have to be the same, so tailor your Buddha bowl to your taste preferences and get creative! Words of wisdom- when in doubt, if it’s a whole food, add it to your bowl. 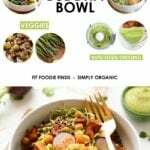 Below I’ve laid out some of my favorite Buddha bowl add-ins by category! 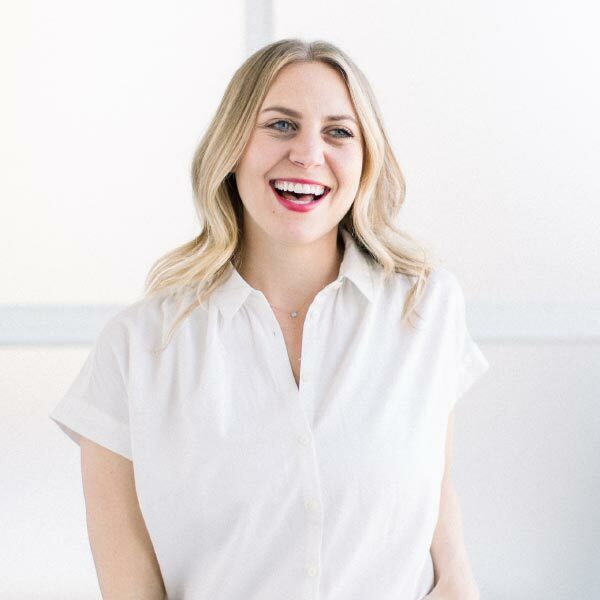 What is a buddha bowl? My classic vegan buddha bowl recipe includes a whole grain, lean protein, tons of vegetables, nuts, seeds, and a dressing of your choice. Add your favorite whole grain to your buddha bowl. I think of it as the ‘base’ to my meal prep bowl. 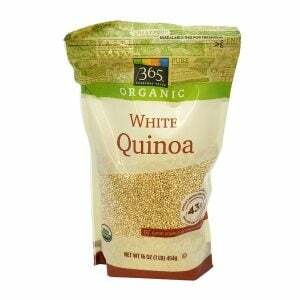 My go-to grain is always quinoa because it is a complete protein and it is ready in minutes! However, I have gotten out of my comfort zone recently and tried new grains like farro in this Roasted Butternut Squash Kale Salad with Farro. It’s pretty dang good! 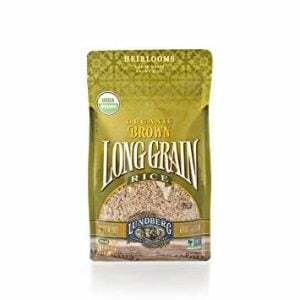 Now, I’ve listed out some of my favorite whole grains below! Think more about high protein and less about calorie count! 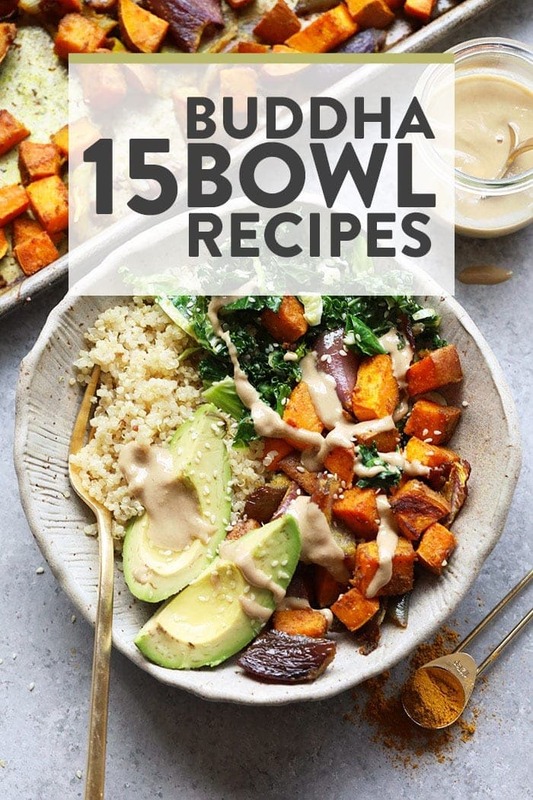 Classic buddha bowls are vegan buddha bowl recipes (plant-based), but you always have the option to add in some animal protein to your buddha bowl recipe if you would like. Here are some protein options for a vegan buddha bowl or a meal prep bowl! Vegetables are one of my favorites parts of a buddha bowl! Why? Because the options are endless. You can use any veggie that is left over in your fridge or decide on what direction you’re going to take your Buddha bowl based on what veggie you choose! In my opinion, you can’t go wrong with roasted sweet potatoes. Check out our post on how to roast sweet potatoes for a quick way to roast your taters! Another easy way to add vegetables to your buddha bowl is to prepare a salad and divide it up between your meal prep bowl for the week! Try adding this Massaged Kale and Fennel Salad or this Thai Chili Corn Salad. You can’t go wrong with some massaged kale, either. Don’t forget to add crunch and more flavor to your buddha bowl with nuts, seeds, and dressing! I love to add roasted pecans or pumpkin seeds to my salad for extra crunch and fiber. Any nut or seed will do! As for dressing, I love a classic green goddess dressing. Sometimes I’ll even skip the dressing and use a dollop of hummus. It makes my buddha bowl creamy and delicious! Guys, the sky is the limit! 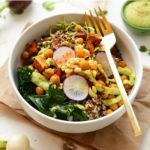 Now that you know the ins and outs of what’s in a buddha bowl, I’m going to share a basic vegan buddha bowl recipe for you to sink your teeth into. This recipe is 100% plant based and a great starter buddha bowl recipe for you to add to. This is our basic vegan buddha bowl recipe. 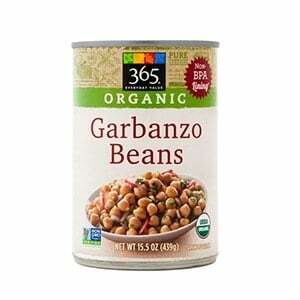 It’s made with quinoa, roasted sweet potato, garbanzo beans, massaged kale, bean sprouts, and green goddess dressing. Get creative with your Buddha bowl and use whatever grain and protein you desire! Place all ingredients into a bowl and dig in! For 1 cup of massaged kale, you’ll need about 2 cups of kale, .5 tablespoons olive oil, and a pinch of salt. Massage until kale is shiny and more wilty looking. 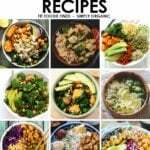 Meal-Prep Vegetarian Kung Pao Quinoa Bowls + 5 more bowl recipes!